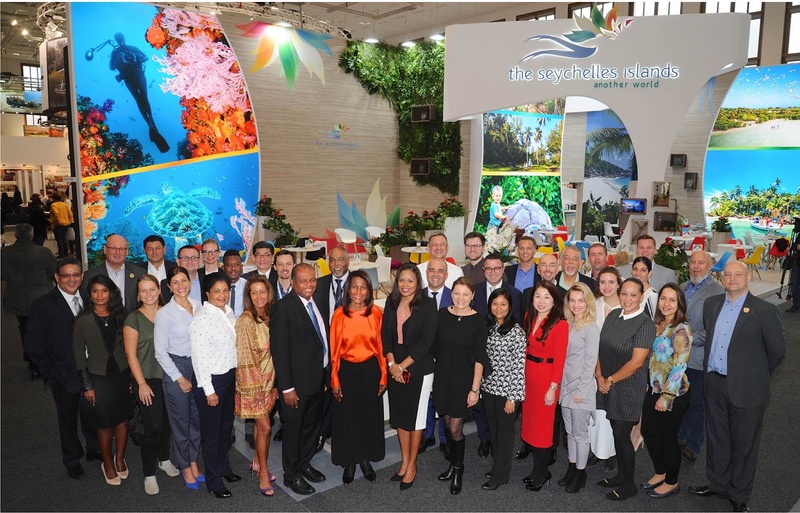 Announced by the Seychelles Tourism Board (STB) Headquarters in February 2019, Seychelles’ delegation pull the spotlight on the destination at the 53rd edition of Internationale Tourismus-Börse Berlin (ITB) travel trade fair during a five-days event in the German Capital. 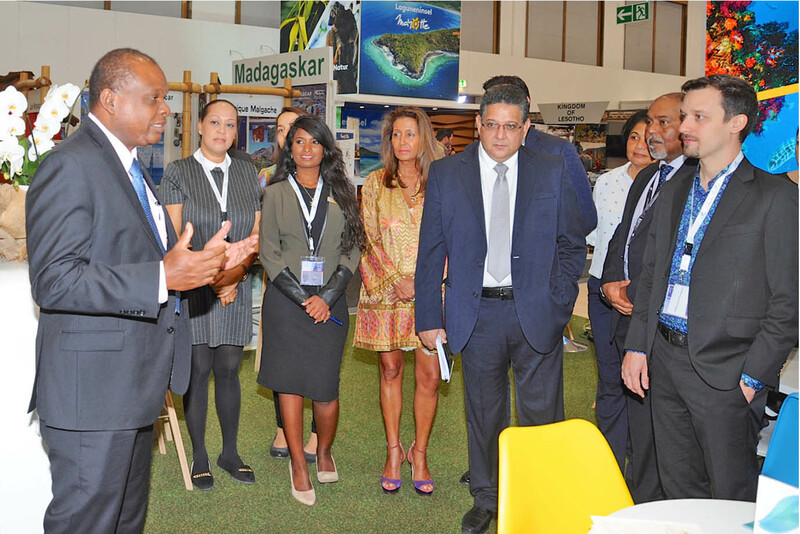 A strong group comprising of 42 representatives from 21 companies and institutions were on site at the Seychelles’ 180-square-meter stand in hall 20 on the Berlin fairgrounds to promote the destination during the event which took place from the March 6, to March 10, 2019. The delegation was headed by the Minister for Tourism, Civil Aviation, Ports and Marine, Mr. Didier Dogley supported by the presence of STB Chief Executive Mrs. Sherin Francis. They were accompanied by Regional STB Director for Europe, Mrs. Bernadette Willemin, Ms. Edith Hunzinger, STB Director for Germany, Switzerland, and Austria along with STB presentatives from Headquarters Ms. Winne Elisa, Marketing Executive from the Destination Development Section and Randy Rosalie Senior E-Marketing Executive from the Digital Marketing Section, all present at the event to create awareness about the destination and create visibility for the brand from the Seychelles stand at the ITB and on the various related STB Social media platforms. ITB, which is considered as one of the largest platforms in the Western European region to make available supply and demand in the Travel and Tourism trade remains extremely demanding requiring an- 8 hour a day of energetic publicizing of the destination over a period of five days. The destination posed itself alongside more than 10,000 exhibitors from nearly 190 countries and territories; during the first three days of the event, access was restricted to trade visitors while over the weekend, the show was also open to the general public. Commenting on this year’s edition of ITB Ms. Edith Hunzinger, STB Director for Germany, Switzerland, and Austria stated her satisfaction. 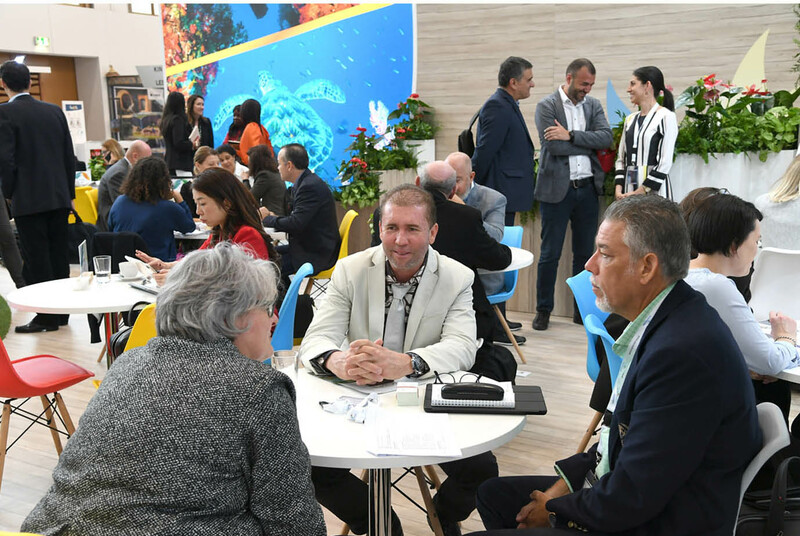 “It has been an amazing show, the large numbers of our local enthusiastic attendees underlined again this year, that Germany is and remain one of the most important market for the Seychelles. We could also experience an increase of visitors on our stand not only on trade days but also massive desire for information on consumer days Saturday and Sunday, “said Ms. Hunzinger. STB was privileged to count on the presence of its local trade partners who rallied to make the destination’s appearance an impactful one. The presence of several representatives from hotels, airlines and Destination Management Companies (DMCs) were noted, all promoting their various products associated with the Seychelles brand. On the DMCs side Representing 7° South were Mrs Anna Butler Payette and Dorina Cedras; Creole Travel Services represented by Mr Guillaume Albert,Mr Eric Renard, Mr Philippe Cornaille, Ms Amanda Lang and Ms Luisa Mehl; while Mr Lenny Alvis and Mrs Elza Frichot Dahoo represented Mason’s Travel. Hotel partners during ITB remained very strong with the presence of Mr Fabrice Collot and Ms Patricia de Mayer from Banyan Tree Seychelles; Berjaya Hotels Seychelles represented Ms Wendy Tan; Mrs. Foram Varsani from Cerf Island Resort; Coral Strand Hotel and Savoy Seychelles Resort and Spa represented by Ms Ekaterina Gritsenko; Mr Ash Behari on behalf of both Coco De Mer Hotel & Black Parrot Suites; Denis Private Island/Carana Beach & Indian Ocean Lodge all represented by Mr Alan Mason. Mr Manuel Policarpo and Ms Rui Oliveira were present on behalf of Eden Bleu Hotel; while Mr Anthony Smith, Mr Andre Borg and Mr Daniele Fabbri represented Hilton Seychelles; Kempinski Seychelles Resort & Spa’s representatives were Ms Agata Sobczak and Mr Masami Egami; Le Duc de Praslin/Valmer Resort was represented by Mr Derek Savy and Mr Robert Payet; Mr Marc Wozniak and Mrs Jenny Seraphine delivered on behalf of Le Meridien Fisherman’s Cove; Le Relax Management was represented by Ms Devi Sumayna Budhoo. Other hotel establishments were Maia Luxury Resorts & Spa /Paradise Sun were represented by Mr Ferruccio Tirone; Mr Eddie D’Offay of Pure Seychelles Hotels was present; Raffles Seychelles was represented by Ms Ernestina Bertarini and Ms Sylvia Fletcher; Mr Sherif El Mansoury from the H Resort Beau Vallon Beach Seychelles. Coco Charter was represented by Mr Konrad Tarasiewicz and VPM Yacht Charter Seychelles by Mr Bernd Loeffel and Mr Jonathan Loeffel. Commenting on the Seychelles participation at the STB event, Mrs. Sherin Francis STB Chief Executive mentioned her satisfaction at having received an incredible attendance from local partners. She also conveyed her satisfaction to have had a successful event at the 53rd Edition of the ITB, she mentioned that this annual opportunity to meet with partners on the Germany territory and beyond—given ITB is seen today as a world event, was well-timed to review the market approach and strategies. “We were anticipating to have an excellent event at the ITB this year and we must admit that the welcome received from our various partners and clienteles especially the germans was beyond our expectation. The STB’s efforts are strongly being supported by our local trade partners so as to ensure that Germany remains one of our prime markets,” said Mrs. Francis.